Printmaking students David Spencer-Pierce and Kaitlin White. NEW ALBANY, Ind. — Two outstanding IU Southeast printmaking students have been honored with opportunities to share their art and advance in their creative field. David Spencer-Pierce, a senior fine arts student from Salem, Ind., has been awarded an assistantship at the renowned Frogman’s Print Workshops in Omaha, Neb., where he will assist two professors with their workshops in July, 2016. 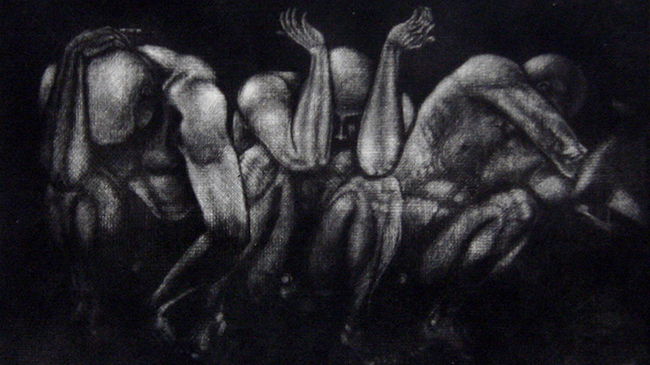 Now in their 35th year, the celebrated Frogman’s workshops bring emerging and professional artists from across the country to teach and take workshops in lithography, intaglio, relief, screen printing and more. Spencer-Pierce, who has been making prints since high school, and focuses on figurative work in woodcuts and mezzotints, is preparing applications for graduate school. 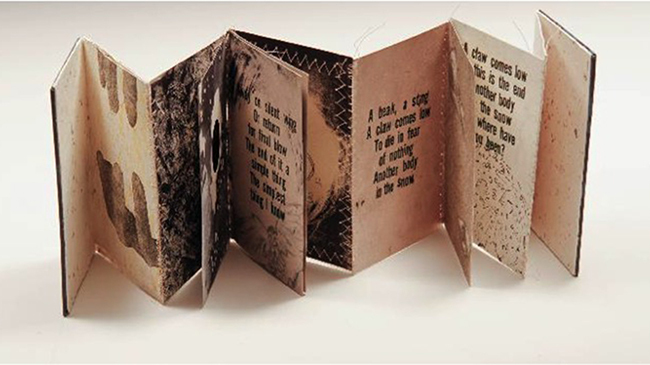 Kaitlin White, a senior from Depauw, Ind., has been invited to show her handmade artist’s book, “Slight,” in the Four Rivers Print Biennial, a national juried exhibition held at Southern Illinois University, in Carbondale, Ill. White’s work was among 56 pieces selected from among more than 250 submitted by 67 artists. The book was selected by juror David Jones, current president of the Southern Graphics Council International, the largest printmaking organization in the U.S.
“It’s very gratifying to be recognized, because it’s the first time I have submitted to a show,” said White. She envisions a career in a museum, where her understanding of inks, acids and papers — the basic ingredients of printmaking — are valued in archival work. Kaitlin White, “Slight,” an artist’s book, mixed media. Susanna Garts Crum, assistant professor of fine arts in printmaking at IU Southeast, praised the tenacity and passion that White and Spencer-Pierce bring to their work, which is evident in its craftsmanship. 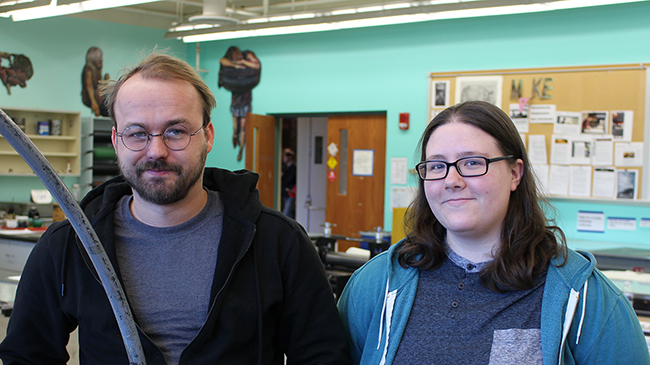 “David and Katie set a great example in the shared space of the printmaking studio, as they take their work and ideas seriously and are always pushing themselves to try something they’re not yet comfortable with,” said Crum. Of the opportunities before them, Crum believes that Spencer-Pierce will gain teaching experience and significant preparation in studio management, while White’s work will benefit from exposure to that of other artists, and from getting her own name out in the printmaking world. “Having IU Southeast students participate in national exhibitions and workshops means that other organizations and galleries will learn that our printmaking program is engaged with exhibition and workshop opportunities on a national scale,” Crum said.